Billing Deposits can be really messy if you don’t find a solution and fast. After Mr. Cortez explained to New In The Market what this Meralco Billing Deposit is all about, he touched on some troubling matters that concerns condominium unit-owners whose Administrators handle all electrical bills for their residents. Mr. Cortez’s uncle owns a condominium unit but the housing association administers his utility bills. He, Mr. Cortez’s uncle, was now being asked to pay for the Meralco Billing Deposit that the condo association is asking for. Should Mr. Cortez pay the Billing Deposit? He should because that is the law, right? Now, what about the refund that Meralco gives after three years if the condo association pay their bills on time? Will he and each of his neighbors get such refund as a benefit to this kind of arrangement? At this point, the reality is the housing association is the only one directly dealing with Meralco. Now, if and when the condo admin gets any thing in return, residents won’t have any way of knowing it. We won’t have any problem if the housing association is honorable, above board, and above reproach but that is not always the case. Meralco publishes – online or in broadsheets – condo association or companies that will get refund out of Billing Deposits. This will give more residents the information and make housing associations accountable to such refunds. Since creating an internal system can be problematic and stressful, Housing Associations should pass a resolution that residents will vote on and agree where the refunded money will go to: Will it be to charity? Will it be to infrastructure projects that will improve conditions of the condominium they all live in? Will it be equally distributed according to the size of the condominium owners are living in? There aren’t easy answers but Meralco is staring all of its customers in the face and are asking you – with the law on their side – to pay this (what others call, diabolical) Billing Deposit. We need solutions, we need to act fast, and we need to make Meralco accountable for this belated notice after this. If you have more ideas on how to address this, drop me a note and we will add your name and solution to help others get through with this. Besides, it is in solutions we thrive, not in pointing the blame. Thanks Mr. Atienza for replying.. What i meant is, we are renting an apartment. There are 7 apartment here in our place. Each has its own meralco meter (not sub-meter). We pay our own electric consumption. When we received the bill of meralco, the first thing came to my mind.. Meter deposit, it’s not even in our name and we were not the one who applied for it nor paid the initial deposit. So i asked our landlord, he got mad and said “kayo magbabayad nyan dahil kayo ang mapuputulan. Hindi rin kami nagbayad ng meter deposit nyan kundi ang unang-unang umupa dyan”. Ang naisip ko, tenant lang kami e. Sample, if we will pay for it na, and we decided to leave the place the next month.. Para kaming namigay ng pera sa meralco at sa landlord namin. Kasi in the end sino ba makikinabang sa deposit nyan. Kung ndi man ung landlord e ung susunod na uupa sa amin. Kaya i thought, if we pay for it, if it is possible to transfer it to our name para kung umalis kami sa inuupahan namin e ipateterminate namin ito for us to get the meter deposit we paid. Please let me know kung tama ba ang pag-iisip ko. Hindi pa kasi kami nakakapagtanong sa meralco e.
First and foremost, I apologize for only responding now. I wasn’t blogging because of a business I’m putting up this year. I hope you will find value in this reply. You are very right in your analysis. 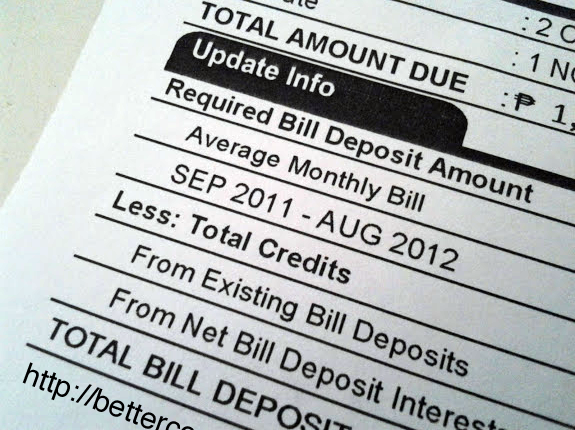 Your landlord will definitely receive the refund in three years time if you pay your electrical bills on time. I suggest that you allot time to meet and talk to a Meralco Consumer Welfare Representative and say your grievances. I don’t promise that your problem will be solved but to prepare you to do the next step in looking for another place to move out to if such an issue is a big deal to you. Good luck and I hope you get the answers you need to make the right decision to make you happy.